BERKELEY, CA—Horst Simon, an internationally recognized expert in computer science and applied mathematics, has been named Deputy Director of Lawrence Berkeley National Laboratory (Berkeley Lab). "Horst is a strong leader who has helped to lead a tremendously productive program in high performance computing that is world-class," said Berkeley Lab Director Paul Alivisatos. “As Deputy Director he'll help me lead major scientific initiatives, oversee strategic research investments, and maintain the intellectual vitality of Berkeley Lab." Prior to this appointment, Simon served as Associate Lab Director for Computing Sciences. In his capacity as Associate Lab Director, Simon helped to establish Berkeley Lab as a world leader in providing supercomputing resources to support research in fields ranging from global climate modeling to astrophysics. He is also an adjunct professor in the College of Engineering at the University of California, Berkeley. In that role he worked to bring the Lab and the campus closer together, developing a designated graduate emphasis in computational science and engineering. In addition, he has worked with project managers from the Department of Energy, the National Institutes of Health, the Department of Defense and other agencies, helping researchers define their project requirements and solve technical challenges. 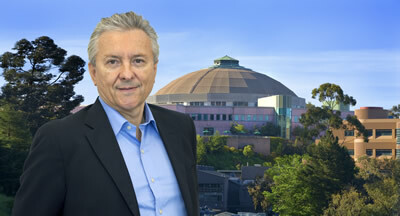 Simon joined Berkeley Lab in early 1996 as director of the newly formed National Energy Research Scientific Computing Center (NERSC), and was one of the key architects in establishing NERSC at its new location at Berkeley Lab. Under his leadership NERSC enabled important discoveries for research across a wide spectrum of scientific disciplines. Simon was also the founding director of Berkeley Lab's Computational Research Division, which conducts applied research and development in computer science, computational science, and applied mathematics. He holds an undergraduate degree in mathematics from the Technische Universtät, in Berlin, Germany, and a Ph.D. in Mathematics from the University of California at Berkeley. Simon succeeds Jay Keasling, who served as interim Deputy Director. Keasling will return to his duties as Chief Executive Officer of the Joint BioEnergy Institute. Lawrence Berkeley National Laboratory provides solutions to the world’s most urgent scientific challenges including clean energy, climate change, human health, and a better understanding of matter and force in the universe. The Lab is a world leader in improving our lives and knowledge of the world around us through innovative science, advanced computing and technology that makes a difference. Berkeley Lab is a U.S. Department of Energy (DOE) national laboratory. It conducts unclassified scientific research and is managed by the University of California for the DOE Office of Science. Visit our website.